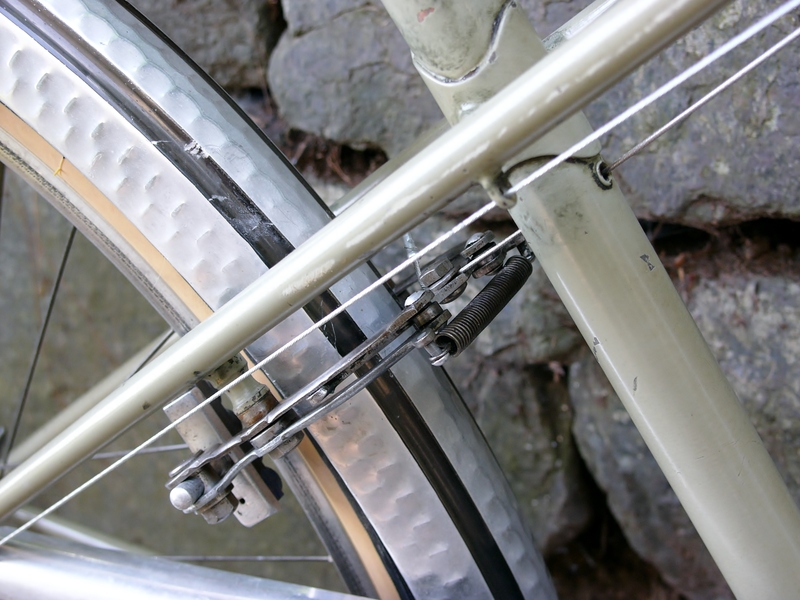 Having spent hours cleaning and polishing vintage aluminum bicycle fenders, I have wondered if there is a way to improve the efficiency of this process without harming a vintage fender’s finish? Maybe not, but there are some products that work a bit better than others and are less likely to scratch or damage the fender’s finish. 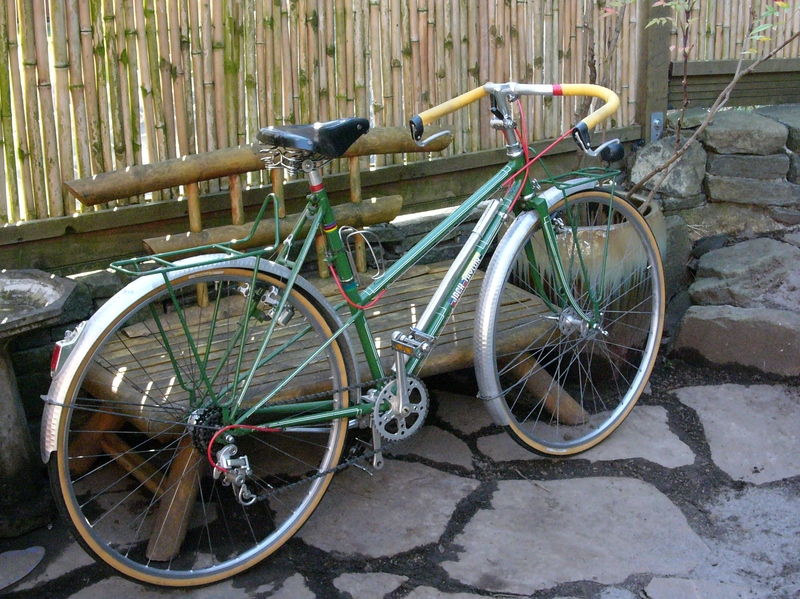 Aluminum fenders – hammered, patterned or smooth – are often found on vintage bicycles with 650b wheels. 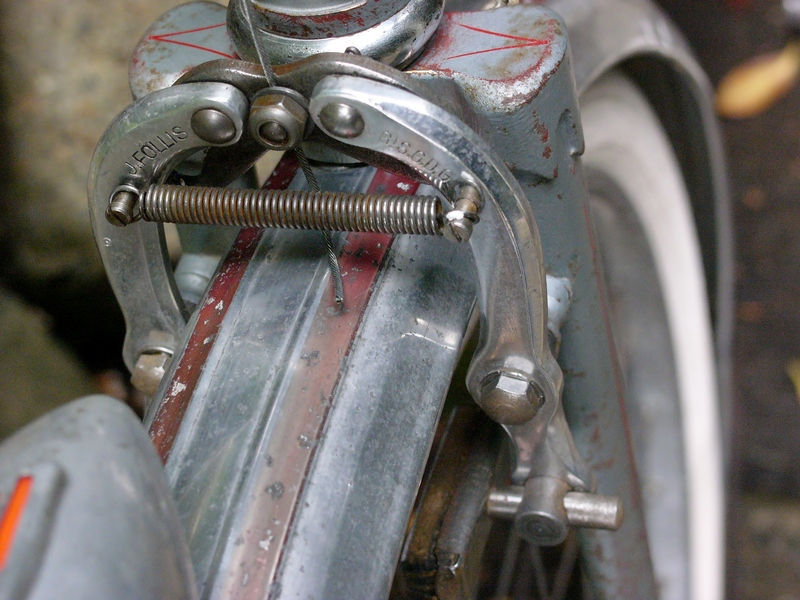 Steel fenders, painted or chromed, were also used – although not as commonly as their aluminum counterparts. 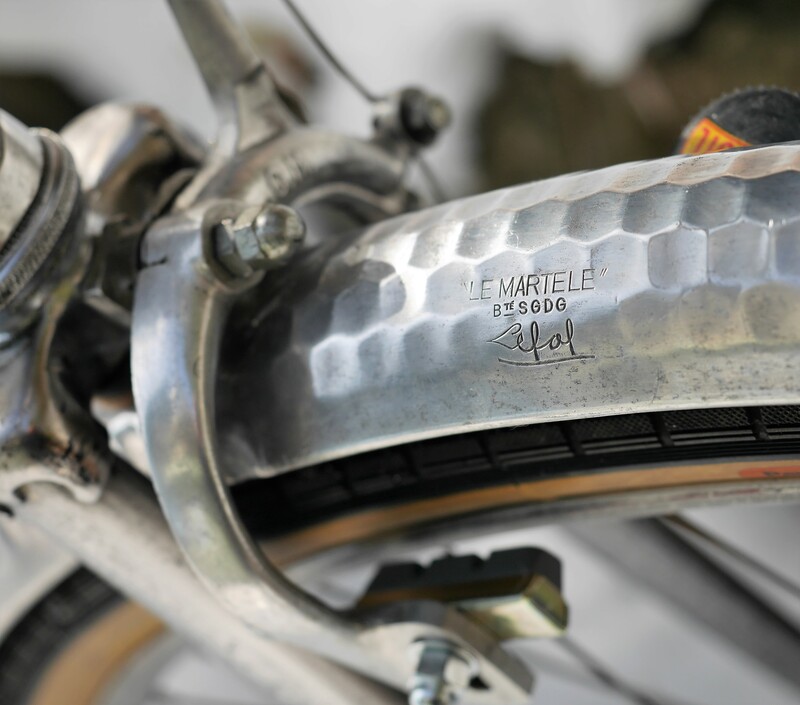 Lightweight chromed steel fenders can be found on some French, British, and Italian randonneuring bikes dating from the 1950’s on. But, aluminum alloy fenders were generally the material of choice in those days. 1950’s hammered fenders with dark brown paint highlights. Vintage aluminum alloy fenders can have painted portions to add color highlights. Cleaning and polishing these fenders involves a number of steps. You don’t want to use any product that will dull the color highlights. So, it’s best to focus on the unpainted portion of the fender for polishing. As a first step, I remove the fender from the bicycle frame and remove all the mounting hardware. Then I gently wash it with a mild surfactant, such as Finish Line’s pink bike wash. After that, I continue the cleaning process with a clean rag and some alcohol. Because the fender is flexible and subject to damage I place it over an inflated tire of similar width, mounted to a wheel and position this into my truing stand. I prevent the hub from turning by securing the spokes to the stand. This prevents the fender from getting twisted or misshaped while its being polished. Once the fender is clean it is time to think about the best product to use for polishing. 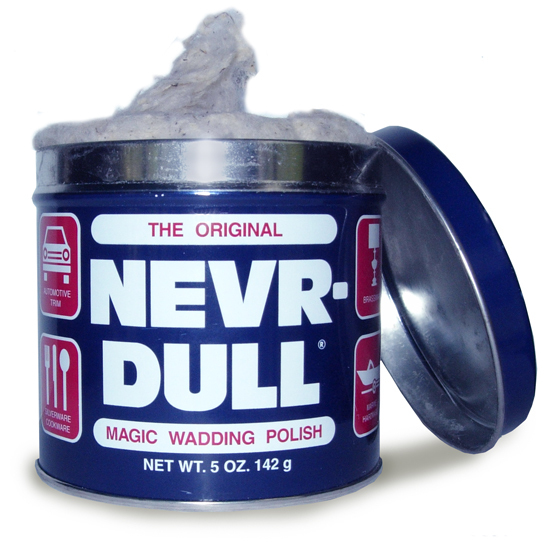 For aluminum fenders, a wadding polish such as Nevr-Dull seems to work best. I have tried many other polishes, but have found this product to work most efficiently and with the best results. That doesn’t mean that you won’t need to reapply this product many times over a heavily tarnished fender. 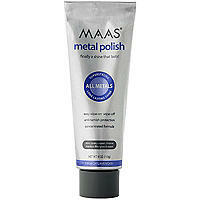 I have also used MAAS metal polish with excellent results on any steel component. So it is a good choice for chrome steel fenders (and any other steel component). 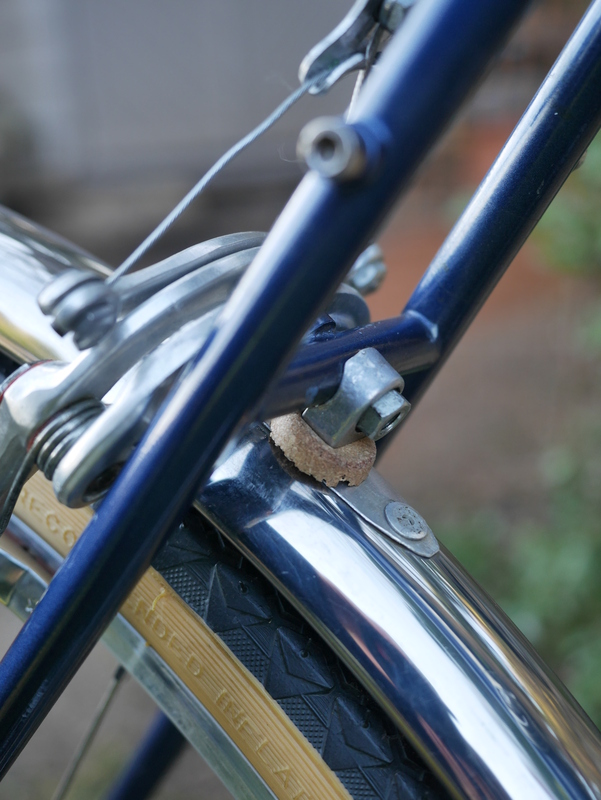 My 1973 Jack Taylor’s fenders were seriously tarnished and dull when I acquired the bike. After polishing the fenders (over many hours), the luster of the metal was restored, as you can see from the photo above. I used Nevr-Dull to polish the fenders. 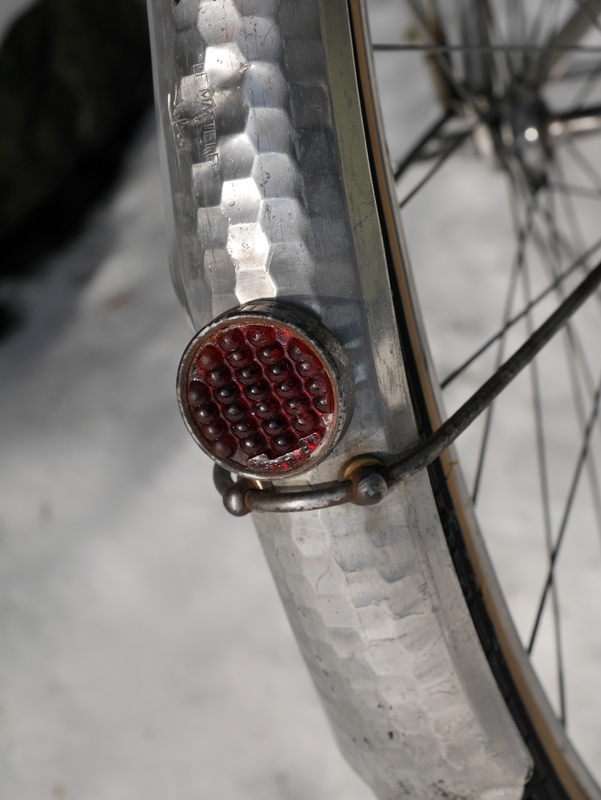 The Lefol aluminum fender shown above is from an early 1950’s bicycle. Cleaning and polishing this fender took some time (as in many hours), but the end result was well worth the effort. Using a wadding polish for vintage aluminum fenders will yield the best results, as these products will not harm the underlying metal.